A separate area carved out of the beautiful region of Kota, Baran is located further in the Hadoti province of Rajasthan. A traveller’s dream, Baran is the land of picturesque wooded hills and valleys, where one can stumble upon old ruins that tell stories of an era long gone. The city is known for its Ram- Sita temples, serene picnic spots and vibrant tribal fairs and festivals. The history of Baran dates back to the 14th century when Solanki Rajputs ruled over the region. In 1949, Baran became the head-divisional quarter of Kota when Rajasthan was reconstituted. It became an established district of Rajasthan in 1991.Baran is popular for attracting tourists who prefer exploring the non-commercial aspects of the State. Its architectural marvels, a beautiful collection of temples dedicated to Ram and Sita and mighty fortresses add to Baran’s natural beauty. 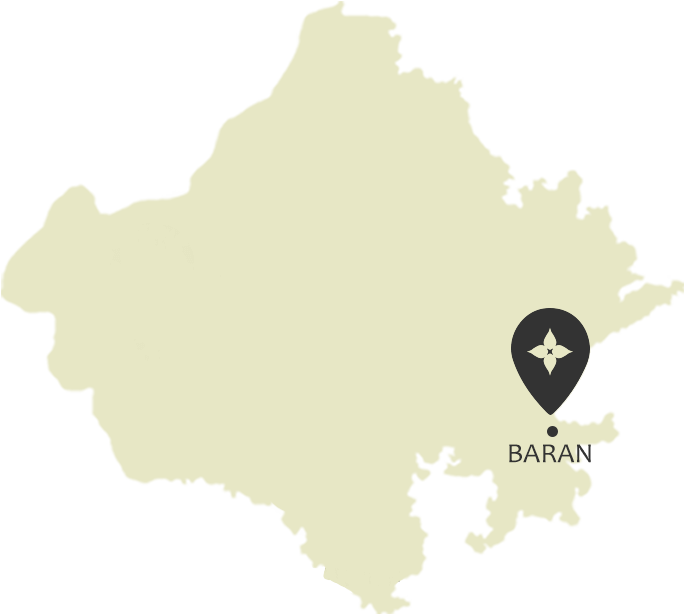 Come explore the wonders and sites that Baran has to offer you. There’s always something to see in Rajasthan. One of the strongest forts in Hadoti, the Shahabad fort is situated about 80 km from Baran. Constructed by Mukatmani Dev, a Chauhan Rajput, this fort dates back to the 16th century. Standing tall in a densely forested area, the fort is surrounded by the intimidating Kunda Koh valley and has some noteworthy structures located within its walls. History tells us that the fort was home to 18 powerful cannons, one of them being as long as 19 feet! Interestingly, Mughal Emperor Aurengzeb also lived here for sometime. Constructed during the reign of the Mughal Emperor Aurangzeb, the Shahi Jama Masjid of Shahabad is situated around 80 km from Baran. An architectural marvel that attracts a large number of tourists every year, the Shahi Jama Masjid was built on the pattern of Jama Masjid of Delhi and is famous for its impressive pillars and intricate ‘mehrab’. Located around 65 km from Baran district, the Shergarh fort is one of Baran’s most popular tourist attractions. Standing on the banks of the river Parvan, it was considered a monument of strategic importance to rulers. Ruled by different dynasties over the years, Shergarh is supposed to have earned its name after its capture by Shershah of the Sur dynasty bit – its original name was Koshavardhan. An inscription from 790 AD reflects the rich history of Shergarh fort and it is among the popular forts of Rajasthan. The perfect destination for nature lovers, Shergarh sanctuary is located in Shergarh village, about 65 km from Baran district. Rich in flora and fauna, Shergarh sanctuary is home to several endangered species of plants, as well as tigers, sloth bears, leopards and wild boards, among other animals. A photographer’s delight, Shergarh sanctuary is easily accessible by road. A beautiful picnic spot in Shahabad near Baran, Tapasviyo ki Bagechi is often frequented by tourists and locals who are looking for peace and serenity. Now a picture-perfect location with stunning mountains acting as a backdrop, Tapasviyo ki Bagechi was once a hub for betel farming, traces of which can still be found. A major attraction here is the large statue of a Shivling. Located 85 km from Baran, Kakuni, situated on the banks for the Parvan River is best known for temples. The Kakuni Temple Complex houses temples dedicated to Jain and Vaishnava gods and Lord Shiva, and some of them date back to the 8th century. Many idols from Kakuni temples have been preserved in museums at Kota and Jhalawar. You can also visit the remains of the Bhimgarh Fort, built by King Bhim Deo here. Named after the sun god, Suraj Kund is surrounded by verandas on all sides. A place of great religious importance, Suraj Kund is visited by tourists for a variety of reasons— from offering their respects to religious deities to immersing the ashes of late relatives in the water that flows out of the Kund, and more. In one corner of the Kund, a Shivling has been placed and devotees flock to pay their respects. Located 50 km from Kota is the Sorsan Wildlife Sanctuary. Popularly known as the Sorsan Grasslands, it is a 41 sq.km bird sanctuary which is home to scrubby vegetation, numerous water bodies and a vast variety of birds and animals. Visitors here can hope to catch a glimpse of orioles, quails, partridges, robins, weavers, greylag geese, common pochards, teals and pintails. Come winter and flocks of migrant birds such as warblers, flycatchers, larks, starlings and rosy pastors fly here. You can also spot animals such as black buck and gazelles. Sorsan Mataji temple, also known as Brahmani Mata Mandir is located at a distance of 20 km from Baran in Sorsan village. The temple houses a special oil lamp, ‘Akhand Jyot’ which, if stories are to be believed, has been burning uninterrupted for 400 years! Every year, on Shiv Ratri, a fair is organised in the temple premises. The fort, located at a distance of about 73 km. from Baran is quite an impressive site. A magnificent structure constructed from red stone, it is also an excellent exemplar of Mughal architecture. The beauty attracts tourists from all over. Renowned for its natural beauty, Kapil Dhara, famous among tourists, is located 50 km from Baran. The famous waterfall and a ‘Gamukh’ housed near the falls are also a big draw among tourists. A grand fort located near Chhabra, located 65 km from Baran is a must-visit tourist spot. Be a part of the festivities and traditions that Baran has to offer. It’s always a celebration in Rajasthan. Engage in the many activities, tours and adventures that await you in Baran. There’s always something to do in Rajasthan.